I was thinking about calling this post the winter of my discontent, but I have been happy with a lot of the things I've been cranking out lately. So, I decided to go with the Old Mac Donald/tweak thing. 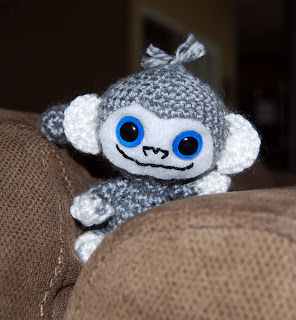 Recently, I decided to rework my java monkey pattern. I guess there was never really anything wrong with the old pattern, but sometimes I just can't let well enough alone. So, I started by making the face from felt instead of crochet. 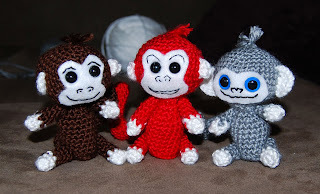 Granted, I like the crochet faces and they seem a bit more authentic to me from the amigurumi standpoint, but I've been itching to get some more detail into the little guys and yarn is just not the media for that kind of thing. 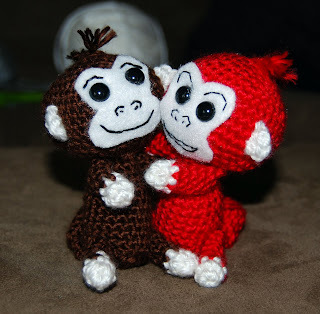 The red and the brown monkeys are the same basic pattern as the original java monkey but with felt faces and embroidered features. I also added little "tufts" of hair and put pipe cleaners in their tails to make them a little more poseable. So, I started on another monkey... the new one leans a little more toward the "kawaii" end of things than I usually go. It has larger eyes and smaller face. I also adjusted the proportions on the body and arms/legs to make him a little less lanky. I do like the proportion changes and the shape of the face is growing on me, but I HATE HATE HATE the embroidery. Thinking that the darker thread was better, I decided to see what 6 strands of embroidery floss looked like on the newest little monkey. Too too much! The nose all but jumps off the monkey's cute little face and RAWR! So, I'm off to try try again. the only question is -- what am I going to do with all these monkeys? 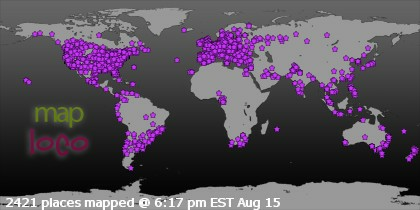 These are all so cute. They each have a very different look, but all so adorable!